Innovative Herb Garden Design . for the home garden and you will have a not only a fresh supply of herbs but also a great attraction and focal point in the garden. Formal herb gardens are often designed along geometric lines. 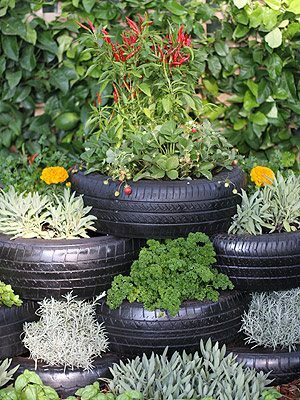 However herb garden design does not need to follow traditional lines, herb gardens can be designed around the use of pots or a herb garden may be incorporated into other parts of the garden or perennial border. Herb Garden design can be elaborate and traditional or informal and simple. When designing a herb garden a number of factors need to be considered. The first step to herb garden design is to determine the possible places in the garden that may be suitable for growing herbs. Like all gardens soil is important, many herbs do well in poor soil, however they will do better in rich soil. Sun is an important part of herb gardens, most herbs like sun. Placement of the herb garden. If the herb garden is to be a ‘kitchen garden’ it may be best to plan the design so that the herb garden is close to the kitchen itself. Pots, in the ground or hydroponics. Herbs can be grown in lots of ways, what do you wish to achieve, lots of herbs, or a great looking garden. If you are looging to grow specific herbs, make a list of quantities and growing heights. Graph paper, ruler pencil compass, yes if you are looking at a formal design you need to be organised when designing the herb garden.